"I think the last time I saw him was about 20 years ago. He was standing on the corner of Illinois Road and Bank Lane, right near your apartment, talking with Amanda. I remember how gorgeous he was and what a worry to all the mothers." After the sadness hit, and grief's familiar relatives made their way through my body (sluggishness & a headache from a mind that begins to drown in thoughts & memories), I realized that when I hear of a death close to me now, it bears double the weight because of Bryce, my former partner's, suicide. The visual that comes to mind is when teenage kids (the same age when LSD above and I were friends) run and do a "pile up" on one other kid's back, and the laughing faces and flailing limbs roll all over the back of the one sitting on the ground until they all topple on top of him. This is how the grief feels when I hear of someone I once loved and their premature death. Perhaps this is how LSD felt before he died. When I re-read the email from my mother's friend, I remember LSD during that time when we were fourteen (and he was fifteen - the first one to drive, no doubt). I remember his killer smile. Driving around in the back seat of his dad's Cadillac convertible. Then driving around the next summer in the back of his own Jeep. I remember always feeling included around him, that I could come over to his house, play in his pool, flirt with the boys, listen to Steve Miller, and joke around. But what else do I remember, as it pops up so clearly from my mother's friend's email, and I think more about now that I'm closer to age fifty (the age those mothers were during that time) than sixteen? Her words, " I remember how gorgeous he was and what a worry to all the mothers." What a worry to all the mothers, she remembers. Her words made me think how lucky I was to get out alive and mostly unscathed. Not in the sense that I was a troubled teen (though in my own quiet way I most definitely was), but that the antics that we got away with during those years makes me shudder at what I could be up against raising a child these days. In the scheme of teenage antics, was what played out back then quite minor? Mostly, yes. At 10:00 p.m. as a handful of giggling 16 year-olds falling all over 18 year-old jocks, while 16 year-old boys yanked out the screen in the kitchen faucet to smoke out. But it made me think about the same scene that replayed itself every weekend until, I wondered, it led straight to what happened to LSD three nights ago. 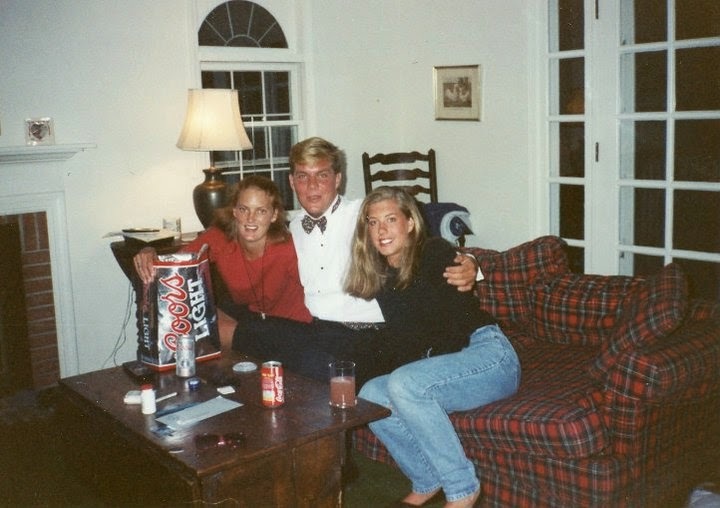 From 1989 at 10:00 p.m. on a Saturday to a fateful Tuesday night this past week in 2010. LSD reached out to me some months ago and emailed me to tell me how happy he was that I had found love again. He had hope in his voice in that message. I've spent this week grieving how hard it was for him to keep that hope going. The same way hope had its way of failing Bryce. I woke up this morning and read that in lieu of flowers to LSD's family, who always welcomed us into their home as much as LSD did, donations should be made to Hazelden. I thought about the obituary that read "age 38" and "Hazelden". Then I thought about my own family. About the thousands of dollars spent on trying to help family members through their addictions. I thought about my two weeks in rehab for family week for a family member's addiction, and how it led my own family to finally recount the addictions of our elders that were still living, now sober, or not. And then I thought about all of our family members who had passed. My great grandfather who took his own life in the bathtub. Or my grandmother passed out at the bottom of my mother's childhood stairs. And how the effects of those memories trickled down...and trickled down...until my loved ones, like Bryce, took their own lives. Then I paused and thought about the Al-Anon "Promises", and how I wished that all of my elders, and Bryce, and our smiling, handsome, friendly, welcoming, LSD, could have lived long enough to discover these promises for themselves. "...We will discover that we are worthy of loving...We will love others without losing ourselves, and will learn to accept love in return...Our sight, once clouded and confused, will clear and we will be able to perceive reality and recognize truth...Courage and fellowship will replace fear...We will be able to risk failure to develop new, hidden talents...Our lives, no matter how battered and degraded, will yield hope to share with others...We will begin to feel and will come to know the vastness of our emotions, but we will not be slaves to them...Our secrets will no longer bind us in shame...As we gain the ability to forgive ourselves, our families and the world, our choices will expand...Serenity and peace will have meaning for us as we allow our lives and the lives of those we love to flow day by day...with (God's) ease, balance, and grace...No longer terrified, we will discover we are free to delight in life's paradox, mystery, and awe...We will laugh more...Fear will be replaced by faith, and gratitude will come naturally as we realize that our (Higher Power) is doing for us what we cannot do for ourselves..."
~From Survival to Recovery, pp. 269-270.